Read and download the full details on building a water harvesting system here! Collecting rainwater from a catchment area, is a low cost, high quality alternative water source that can supplement traditional water distribution systems and improve the environmental quality of farming operations. 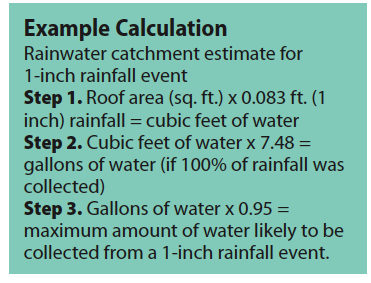 Rainwater harvesting involves the collection of rainfall from rooftops or land-based catchments systems for storage and distribution as needed (Figure 1). Capturing rainfall has the added benefit of improving water quality by reducing soil erosion and runoff. Strategically installed rainwater harvesting systems can be used to direct stormwater around sensitive areas of the farm where animal waste is present, thus reducing the potential for nutrient and pathogen delivery to nearby waterways. Rainwater harvesting and stormwater management techniques can also reduce the volume of water that must be managed in liquid manure management systems by diverting clean water away from manure pits and lagoons. The image to the right is an example of a water harvesting system used on Eden Shale Farm. The design of a rainwater harvesting system can be as unique as any farm. A complicated system is not needed for harvesting rainwater. A basic design consists of a catchment area, distribution lines, storage, and a target (Figure 2). Optimization of the system is accomplished by matching the size of the system to livestock water demand. A Microsoft Excel workbook has been created and is available for download to aid in sizing your water harvesting system based on the demand of your livestock and the catchment area available for collecting water. An instructional tab is provided within the workbook to provide guidance on use and interpretation of the water harvesting system–sizing tool. Water storage structures are the most expensive component of the system. Storage structures in a rainwater harvesting system may include tanks, cisterns, ponds, bladders, or a variety of other options. The storage volume can be equal to or slightly exceed the normal water demand between rainfall events, if the catchment area can provide it. The volume in gallons provides the producer an idea of how long livestock can utilize a specified area based on herd size and water requirements.